I am a little new to online shopping and I have to say, that it's kind of fun! A few weeks ago I brought these single eye shadows and smudge brush. 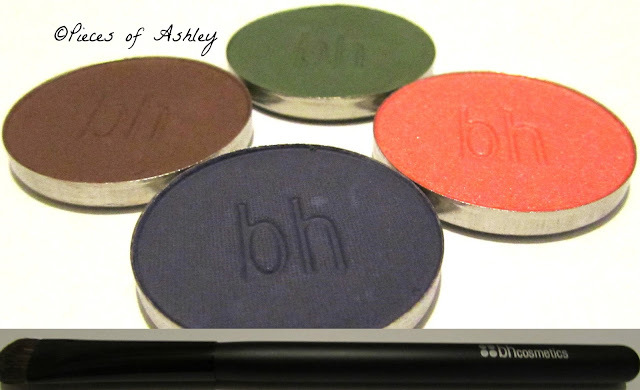 I never brought anything from BH cosmetics before, so I was excited to try their products out! I only brought a few things, for my first time shopping from here. This has nothing to do with my mini haul, but I just brought a new camera and I took these pictures with it. I wanted to see how it worked. It's bad for my first time trying it out! I need a little more practice though! When choosing these colors, I thought about the summertime. Although three of the colors work well with the evening time or like a night out to a party. All of the single colors were only, $0.98! That is a good deal, because I am picking the colors I want. I do not know the exact the color, so I took a just on guessing. It looks like a pinkish/peach color and it's very shimmery. It will look gorgeous on the eye for summertime, with the light hitting the shimmer. I really like this kind of green, it's really pretty and it would go great with any of the other color for a springtime look! I thought this was a really pretty color and I thought it would be great for a smoky eye look! The bristles on this smudge brush feels really soft. It does not feel like it would hurt you or stick you in the eye. When I hold it, it has a good grip. It was $3.19. That's not to bad, so I can't wait to try it! Nice haul! I hear great things about BH eyeshadows, I would love to see swatches of these shadows. Its such a shame that in Australia it isn't easy to get BH cosmetics! I want to try them so bad! Maybe when I do a giveaway, I'll do one from BH cosmetics!